NEW YORK CITY, NEW YORK (The Nil Admirari) - Earlier today, Fox News loose canon Bill O'Reilly stated the government giving corporations "free stuff" was patriotic, but the government giving the American people "free stuff" was "absolute socialism" and "outrageously anti-American." 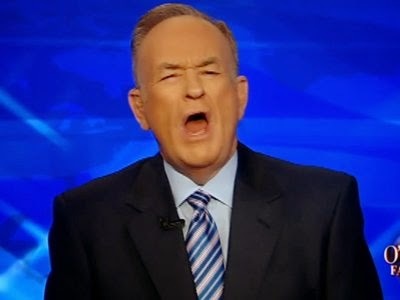 O'Reilly presented his "fair and balanced" strongly held, fact-challenged insights on "free stuff" during the entertainment network's morning show "Fox & Friends," and railed against Democrats in general, and Hillary Clinton and "that terrible socialist" Bernie Sanders, specifically. RELATED: Bill O'Reilly Says Video of Him Kicking Puppy "100% False"
O'Reilly's endorsement of corporate socialism/reverse socialism - which has kept military contractors flush with cash and allowed American corporations to stash trillions of dollars in untaxed profits in offshore accounts - was described by O'Reilly as "affordable." In stark contrast, O'Reilly asserted utilizing democratic socialism to fund things like infrastructure projects, free state college tuition to qualifying students, guaranteed healthcare to all American citizens, and expansion of Social Security was "too expensive." "Corporate 'free stuff' is required to stimulate the economy through tax breaks and taxpayer funded handouts to businesses," explained O'Reilly, who failed to conclude maybe it was not actually "free stuff," after all. "Anyway, this corporate welfare allows businesses to create low-paying jobs and make higher profits that are supposed to trickle-down to everyone else, and totally do." O'Reilly added, "It's just the cost of doing businesses when the government loses hundreds of billions of dollars in tax revenues due to this American corporate welfare. And let's not forget embarrassingly wasteful defense projects like the F-35 Joint Strike Turkey, which is expected to cost at least $1 trillion over the excruciating 50-year life of that project." "So where was I? Oh, yeah. America cannot afford all the "free stuff" that Democrats like Hillary Clinton and, even worse, Bernie Sanders want to give them. So just like I said after the latest mass shooting, we cannot do anything to fix America's problems and improve our country. Just give up. It's too expensive, anyway," stated O'Reilly. O'Reilly closed his argument against "free stuff" for Americans by asserting he was "pretty sure" it would only take "about 30 more years" of trickle-down economics and corporate welfare for "the urchins, bottom feeders, and takers in America" to see "a few bucks."